After entering the connection settings, you will be prompted for your password to login to the system. Enter the password provided in the new user confirmation e-mail. 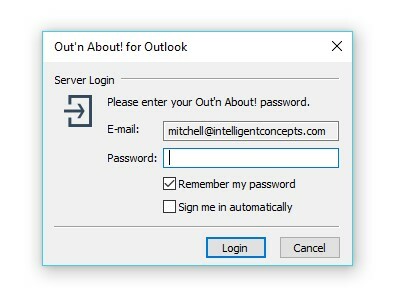 If you do not want to enter your password each time you start Outlook, you can select the ‘Remember My Password’ option. Note: you can change your password later as described in the Configuration Options section. Out’n About! provides information about each user for display on the In/Out Status Board. This information is maintained by each employee or Out’n About! administrator and can be used to add or synchronize your Outlook address book. When you first log in to the Out’n About! system, the software will prompt you to fill in this information so other users see up to date information about you. 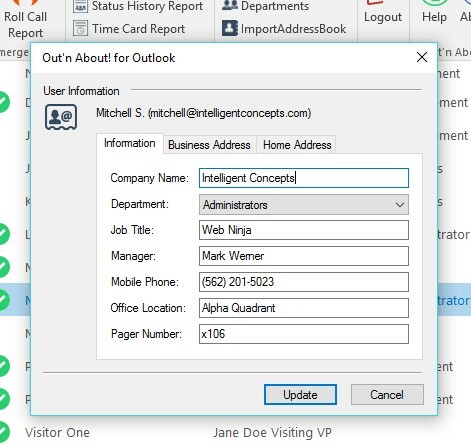 The software automatically fills in each item with your default Outlook contact data the first time you update your information. Out’n About! 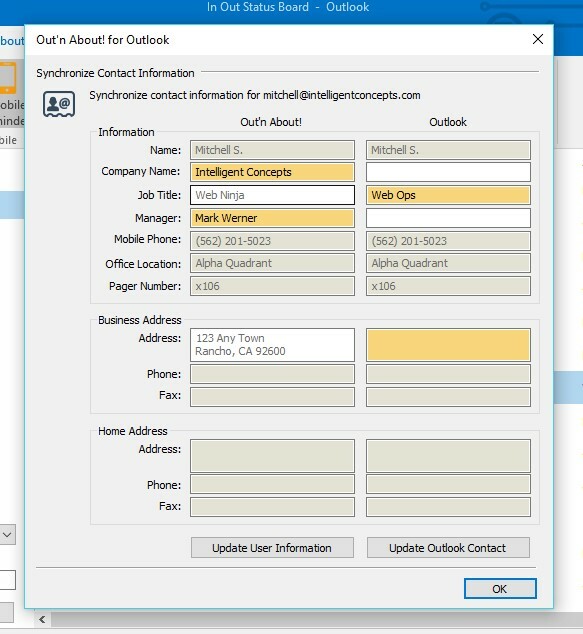 includes a contact synchronization system that allows users to update their Outlook address book based on information provided in the Out’n About! system. 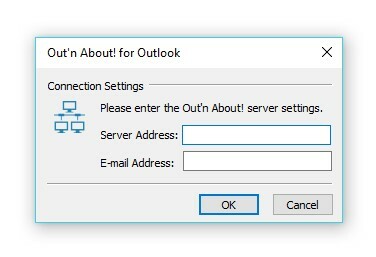 To synchronize or add a contact to your Outlook address book, double-click or right click on the user and select the ‘Add Outlook Contact…’ or ‘Synchronize Outlook Contact…’ menu item. You can perform a status message update when you leave your desk for any reason, such as lunch or a meeting. This feature can also be used to indicate when you are in the office but are not available or do not want to be disturbed. When you are logged into the Out’n About! system the software places an icon in the system tray to allow you to quickly identify and change your status when the Outlook application is minimized. If you place the mouse cursor over the Out’n About! tray icon, the system will provide a tooltip indicating your current status and status message. You can also quickly change your status by right-clicking the tray icon to display the status change menu. You no longer need a message pad or a separate messaging program to communicate missed calls, etc. For example, when you receive a call for another employee, you can quickly check their availability using the board, and then move right to the Message Pad – saving time and eliminating the chance of lost message slips. 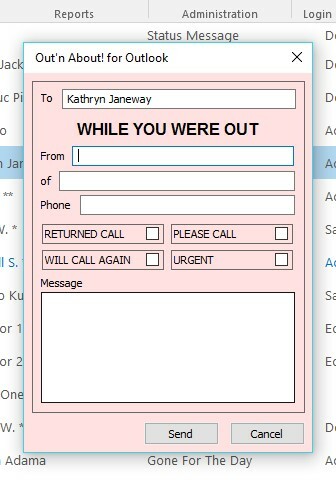 To send a While You Were Out message, double-click or right click on the user and select the ‘WYWO Message…’ menu item. Once you have entered all the necessary information in the message pad, click the ‘Send’ button. The Out’n About! software will send the WYWO message directly to the user via an Outlook message.